Our focus is on defining market-driven strategies. Our focus is on defining market-driven strategies, even for the most strongly engineering-driven companies. Our goal is to put your customers at the center of the strategic map. Our core experience with product management allows us to bridge the gap between technical product features and marketplace perceptions of value. We are skilled at leveraging the creative tension between marketing and engineering to define innovative and effective solutions for our client companies. We back up insight and experience with solid market research. 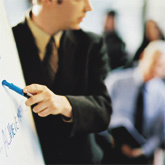 Jumpstart's engagement managers are seasoned professionals drawn from the ranks of technology executives. We are operationally savvy. We understand not only technologies and markets, but also the realities of early-stage funding and the difficult trade-offs that early-stage companies need to make. Although our methodology is based on traditional principles, we avoid academic theory and large-enterprise viewpoints in favor of practical, real-world tactics. A company can't achieve long-term market leadership if it doesn't get the traction it needs to survive. Our goal is to produce rapid results. One of the most common sources of failure in early stage companies is the attempt to execute an entire long-term vision with limited short-term resources. By trying to be too many things to too many people, the company dilutes its brand and fails to leverage its greatest strengths. A significant part of the value in our engagements comes from our relentless dedication to focus. We help our clients identify which options will produce the best results in the shortest amount of time, while laying the groundwork for an eventual expansion toward longer-term possibilities. Our methodology, rather than representing a rigid group of tasks, is a flexible set of tools based on a framework of sound and consistent practice. This allows us to quickly apply only those components that will provide the answers we need. Once we have helped validate our clients' objectives and aligned them with a real roadmap, we create an execution plan to rapidly achieve immediate goals. We work efficiently, quickly, and accurately. Because we are strongly focused on results, we are not dainty or shy with our perspectives. We come up with proposals that reflect what we really see. We challenge pre-existing assumptions. And we tell our clients the truth, even when the truth is uncomfortable. Our goal is to apply our experience and insight to help you find the right answer. Although we encourage and respect decisions made by our clients to move in a particular direction, we will not hesitate to let them know what we think of that direction, its risks, and its potential rewards. Ultimately, we believe that unvarnished, plain truth is one of our most valuable deliverables. We can't quantify the spark, or put it in a jar, or name it in our methodology. But it's there in every engagement. We value creativity not for its own sake, but because an unexpected solution is often the one that allows a company to differentiate itself in a powerful way. The spark is expressed in the insight that says "you should reshape your products as a single-price platform and stop selling components" -- an idea that led to a threefold increase in valuation for an enterprise software client. It rings in an unforgettable tagline: "Where business takes off." It infuses a compelling brand identity that is expressed beautifully and appropriately in every medium. The spark is the hallmark of a successful path to achieving traction. © Copyright 2001-2005, Jumpstart Ventures LLC. All rights reserved.